I know that you know that grinding coffee beans just prior to brewing coffee with them is best… but I also know that even YOU don’t want to do that every single day – every single time you make coffee. Even though I’m a borderline coffee snob I still find myself grinding enough for a few days at a time and back when I was dealing with an infant in the home I would grind about a weeks worth of coffee all at once just to make my morning a tad bit easier as I juggled life at 5am on little sleep. We also also know that there are a ton of different coffee storage containers to choose from sitting at a wide variety of price points… so, I felt it was necessary to build this list of our favorite airtight coffee containers to make things easier on you, the consumer. For me I use the Coffee Gator canister in my kitchen because I’m partial to the brand. They make a lot of different coffee products and they are all made to a very high standard but there are obviously a number of really excellent alternatives. A sealed container that is air tight. Your container needs to be able to vent CO2. The container should block out all UV rays. I believe the Coffee Gator stainless steel container is the best airtight coffee canister because it meets these three main points and because it actually keeps your coffee fresh for the longest amount of time relative to it’s competitors – even when the container is only half full. It is priced very low for the value it offers, see current pricing on Amazon here, and it’s the container I use in my own kitchen! As I’ve already said, that coffee container, is not your only choice. There are other options which are really great too some of which are even less expensive so go ahead and scroll down just a tad to look at all of my top choices for airtight coffee storage. This list below is presented to you in order of our preference, 1st to 5th. Please read our short product reviews and then click through for pricing and availability information. 1. 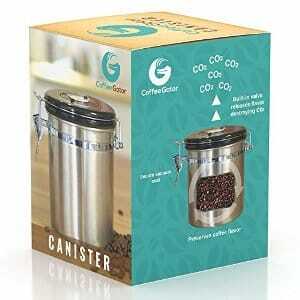 The Coffee Gator Stainless Steel Container – Keeps your coffee fresh even when half full! 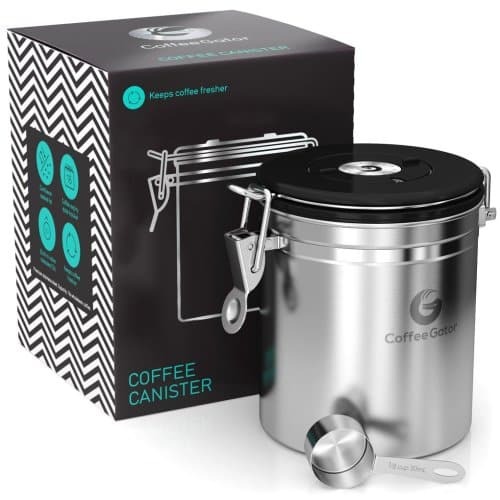 Coffee Gator Stainless Steel Container – Canister with co2 Valve, Scoop and eBookBy far and away this is our favorite coffee storage bin just as it is for so many other happy customers. This is an airtight canister that will keep your coffee beans fresher longer than any other because of it’s CO2 release valve that lets CO2 out but doesn’t let oxygen in. We love this bin because it comes with accessories and lots of literature and because the build quality is so high. Basically if you buy this unit it will last for a long time! There are thousands of people who agree with this and the price is excellent. This is the best coffee container on the market! 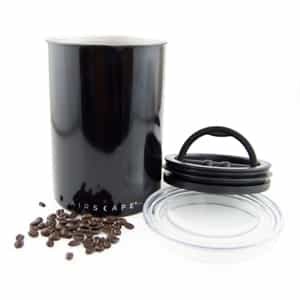 Coffeevac 1 lb – The Ultimate Vacuum Sealed Coffee ContainerThis model is our second favorite vacuum sealed coffee canister because it’s just as durable as the Coffee gator mentioned above. You’ll love it if you want a streamlined look in your kitchen (there isn’t a latch on the side) or if you want to choose your favorite colors – there are a lot of colors to choose from. The price of this is lower than the Coffee Gator but the accessories aren’t included. Even still this is an excellent value and will keep your coffee fresh by letting carbon dioxide escape while not letting O2 enter. Friis 16-Ounce Coffee VaultThis is another well priced coffee storage container that will vent gasses out but not let gasses in – this is exactly what we want to keep coffee from going bad. As far as price is concerned the Friis coffee vault is fairly low in price (which is why we like it). It even comes with a scooper too! We are also confident that this can will be durable enough to last you a long time due to it’s stainless steel construction. 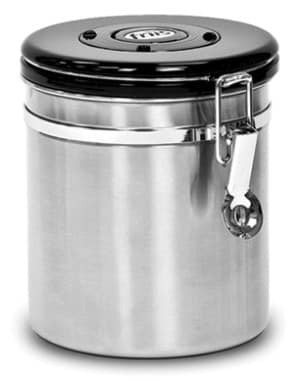 Airscape Coffee and Food Storage Canister, 64 oz with Patented Airtight LidThe Airscape canister is a great design for people who don’t want rickety latches. The screw-top lid creates the airtight seal you need to keep your coffee tasting it’s best. Another benefit to this model is size, you have the option to buy this in large 32 oz or 64 oz sizes! If you go through a lot of coffee then you will love this larger coffee vault! 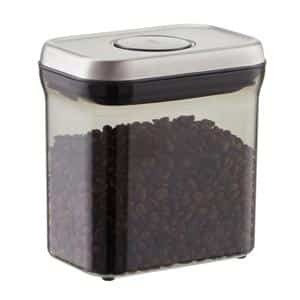 OXO Good Grips Airtight Coffee POP ContainerMost countertop coffee canisters are made of solid stainless construction. This is meant to keep out the light which has a negative effect on the coffee beans. You’ll love this airtight coffee bin from Oxo because you can see how much coffee you have left at a glance while the bin prevents the harmful UV light from getting in to do it’s damage. Not only is the Oxo coffee container going to keep your coffee fresh but it’s easy to pour out of, clean, and stackable… it’s priced very well too! How Long Does Ground Coffee or Whole Bean Coffee Stay Fresh in One of These Containers? To better understand the answer to that question you have to understand how coffee loses it’s freshness to begin with. A green (unroasted) coffee bean can stay essentially fresh for a year or two in an ideal dry storage environment. Once a green bean is roasted however it starts to oxidize, or react negatively to oxygen that touches it’s surface. The vast majority of a coffee bean however is not located on the surface until it is ground up, at that point each bean particle has it’s own surface area and all of those areas start to oxidize, they release more carbon dioxide, and oils start to dry up. Light can speed up the process while moisture can make the beans or grind go bad faster and in different ways. As we all know, moisture tends to allow bacteria to thrive. Dry roasted coffee beans will not necessarily ever go bad but the freshness levels will decline significantly by the end of 3-4 weeks unless the beans are in a sealed and airtight environment free of as much airspace as possible. When placed into a coffee vault or airscape environment there is less oxygen to eat away at the bean and the beans can stay a bit fresher for longer. A highly trained and refined palate can tell when a roasted batch of coffee beans has been in an air sealed container for 2 months but the average person in their home typically cant tell until more time has passed. With ground coffee the longevity of coffee freshness is much tighter. Unsealed ground coffee starts to noticeably lose its fresh flavor after a day or two tops. If that grind is stored tightly in an air sealed canister I believe the vast majority of people won’t be able to notice a meaningful loss of freshness for 7-10 days depending on how finely ground the beans are. Remember, this all has nothing to do with whether or not the coffee is going bad. You can safely drink stale coffee that is very old without getting sick… it just won’t taste good. See this post for more on how to tell when coffee has gone bad. The canisters listed above on this page are meant to slow the decline in freshness of the beans or grind but nothing can stop it. In the best of all worlds you would roast your beans, wait three days for the initial CO2 to release from the beans and then grind them immediately before setting up your brewer. 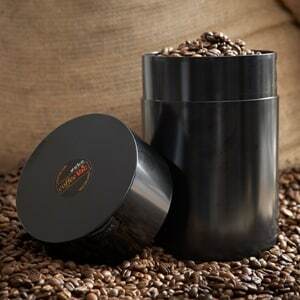 I still believe the Coffee Gator container is the best holding place for those beans or the grind but its certainly not the only good canister. Buy the one that makes the most sense for you and your wallet… but above all, get one because even the worst one is better than nothing at all.